Vodafone is introducing a worldwide maternity policy, offering significantly better terms than the statutory minimum in many of the countries where it operates. The policy includes a minimum of 16 weeks fully-paid maternity leave. New mothers returning to work will be offered a 30-hour week on full pay for the first six months. The company said one of the main motivations was to recruit and retain women. The policy will be introduced by the end of 2015 in all the countries where Vodafone's operates including Africa, Asia, the Middle East, Europe and the US. Statutory maternity policies vary across the regions where Vodafone operates but the company said it had decided to provide a minimum level of support to expectant and new mothers at all its businesses. The impact is likely to be greatest in African countries, India and the United States where legal minimum provision is low. The company described the policy as "pioneering" as very few international organisations or businesses had introduced comparable policies, it said. As well as making it a more attractive employer, Vodafone hopes to cut the costs incurred when staff leave to have children. "There are a lot of hidden costs when you lose women to maternity: retraining, recruiting, business disruption," said Sharon Doherty, the group's Organisation and People Development Director, who developed the policy. "You have to look at the total picture, not just obvious upfront costs." The minimum 16 week paid maternity leave will mark an improvement in Vodafone's maternity provision in ten of the 30 countries where it operates. The new policy on reduced hours for mothers returning to work is a new benefit in 27 of its locations. Vodafone estimates around 1,000 women will be positively impacted by the changes. 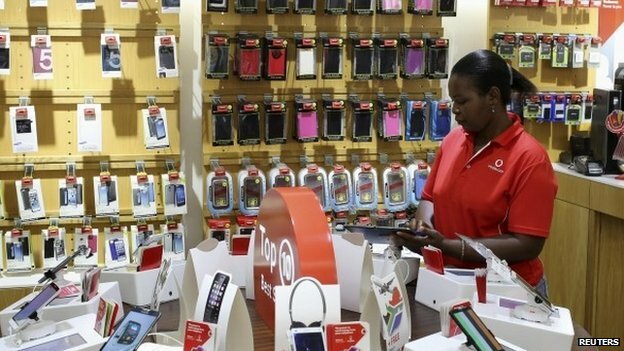 Women make up 35% of Vodafone's global workforce of 100,000, which includes subsidiaries Vodacom and Safaricom. "We'd like that to be a higher number which is why we are looking at progressive policies like this one," added Mrs Doherty. The policy of offering reduced working hours for women returning to work after having a baby is based on the company's practice in Italy. Mrs Doherty said government legislation there "almost forces employers to do this sort of thing" but when Vodafone examined the results they found the rates of return and retention were much higher. So Vodafone decided to adopt it as a policy for the whole group. Joe Wiggins from the employer review website, Glassdoor, welcomed Vodafone's new policy saying it appeared to be a global "first of its kind" package. "People are often scared to ask about maternity benefits. "Vodafone being upfront about this will give people peace of mind. It's rare for companies to talk about maternity benefits in an open way." In developing the policy Vodafone commissioned accountants KPMG to explore the costs and benefits of a more generous maternity conditions. KPMG concluded that the costs of a more generous maternity provision were outweighed by the costs of replacing women leaving the workforce. The accountancy firm said the cost of recruiting and training new employees to replace women leaving the workforce after giving birth cost amounted to $47bn every year. By comparison the cost of offering women 16 weeks of fully paid maternity leave would cost an additional $28bn.